It is important to learn to tie your horse safely. When you tie your horse, you should either use quick release snaps or a quick release knot. With a quick release knot, you will be able to free your horse from wherever it is tied should it become anxious and struggle against the rope. This is a much safer way of tying a horse than with a knot that is tough to come undone. To tie a quick release knot, you need a soft lead rope. Webbing or leather leads that are flat are not suitable for tying. Ideally, you will use a round synthetic or cotton rope. There are a few different ways to tie a quick release knot. This is just one method. Whatever method you use, be sure that the knot will not bind itself if pulled tight from the snap end of the rope. This will not be safe, as the knot will not release as intended. Many people have different ideas about tying solid or tying to a loop of string. Many organizations like the Pony Club recommend tying to a loop of string. Others feel it is unsafe not to tie solid. 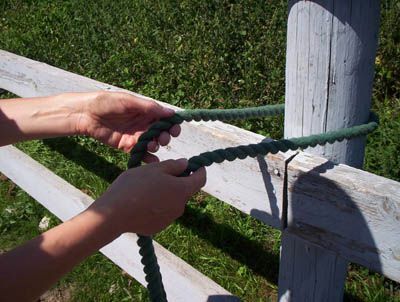 To start, loop the rope around a post, through a ring, or loop of bale twine. The loose end is being held in the right hand, and the snap end is being held in the left. Cross the rope being held in the right hand under the snap end of the rope. There is no need to tighten or twist anything at this point. Next, cross the rope back over the top of the snap end of your rope, and pull a loop up through the resulting circle. Do not tighten any of the loops yet. That will make it hard to complete the knot. The final tightening will be at the end. Be sure you're not tying your horse too short or too long. Then pull the rope tight against the post, ring, or twine. 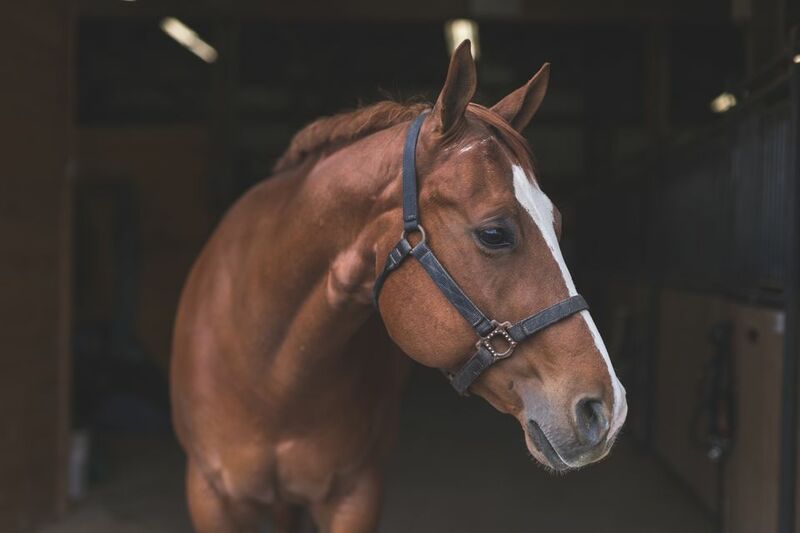 Your horse should be able to move and hold its head in a natural position.you do not want the horse to stand with its head near the ground or have to hold its head up high. The lead rope should not be dangling anywhere near the ground. If there is any chance that the horse could get a leg over the rope, then it is too long. And, you should tie high enough that you do not need to make the rope short. Ideally, the rope should be chest height or higher, depending on what you are tying it to. This diagram shows the quick release knot pattern. Another quick release knot, the bowline knot, is similar, but rather than putting the end of the rope through the rabbit hole, you put the folded loop through so there is a loose end to pull when you are done. To release the knot, simply pull on the loose end. The knot should come undone easily.